Almost thirteen years into this parenting gig, Mommy Guilt (the after-taste of regret from less-than-stellar parenting moments) threatens to abduct my resolve to hang in there. We put so much pressure on ourselves to get it right as a parent. We try and be flawless and kick ourselves for being human and end up in a discouraged. We also put so much pressure on our children to get it right. We try and mold their outward behavior, hoping it will make a heart change, as we lecture them into an agitated state. The must be a better way, right? For starters, you are doing a better job than you think! My dear friend, Laurie reminded me of this the other day. We met for warm beverages and poured out our hearts. 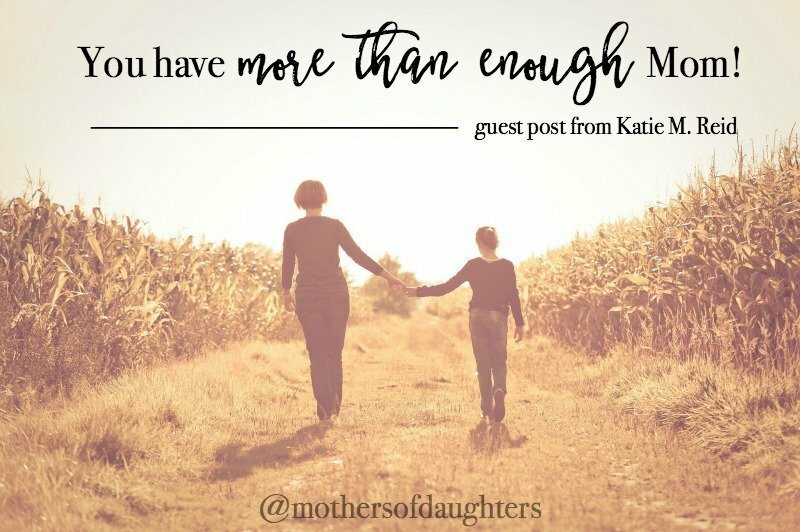 I confessed how I had not done my best with my kids. She stopped me and reminded me that wasn’t true. You fed them (who cares if it was frozen fish sticks). You gave the best you could at the time and there is no reason to apologize for that. I was skeptical. But as I dared believe what she said was true, I could feel the heavy weight of Mommy Guilt drop from my achy shoulders with a thud! Hmm, kind of reminds me of the whole loaves and fish story (from the Bible). What was available seemed meager—even laughable, for what was needed to sustain those gathered ’round. Yet God blessed it and multiplied it and it was more than enough. God takes our meager offerings as parents and transforms them into an abundance for our children—with leftovers even! Instead of trying to muster up enough, or lasso the moon to serve on a silver platter, what if we just gave what we had in our hands and asked God, Jehovah Jireh, to supernaturally make it go further than seems feasible? I often try and do on my own strength, and it comes up short. Yet, my Father in Heaven, who provides manna in the wilderness, is able to sustain me and provide what I need to feed my children’s mouths, minds, and hearts. He makes up for the lack and the slack. We do what we can and we rejoice in what He can do. He specializes in the impossible after all. P.S. Join us in linking up encouragement over at Jami Amerine’s Sacred Ground, Sticky Floors blog. My children is grown-ups today, haply married and God blessed us with three beautiful grand daughters. There were many days that my work taken me away and I was not there and the opposite also happened. When they moved through their teenager stage and till late twenties I keep on doubt if I was the right mom God chose for them. About 10 years back I could really see that I was the right mom as they survived live and the cold “quick”dinners not always wholesome balanced meals. The beautiful encouragement of fish sticks remind me feeding them with food and Jesus.